Being sick is a very helpless place to be. I am at the mercy of doctors, and medications and “experts” who believe they know what is best for me. I have felt invisible, unheard and less then because I am ill. A very uncomfortable and painful place to be, to say the least. As I write this, I am realizing that my AAA Rescue Plan helps me feel empowered, and useful, and valid. And that is sure what I wish for myself and everyone I know! 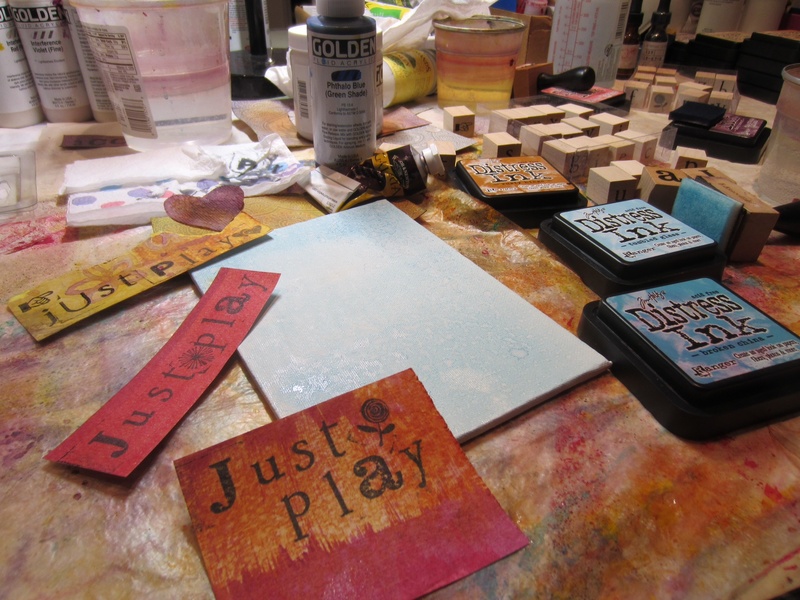 Maybe I’ve said this before, but, the most freeing and supportive words I’ve ever said to myself about creating art were: “Just Play”. These words freed me from the clutches of perfectionism, fear and unrealistic expectations. And honestly, there is point during every piece of art I’ve created where I get tight and scared and judgemental. 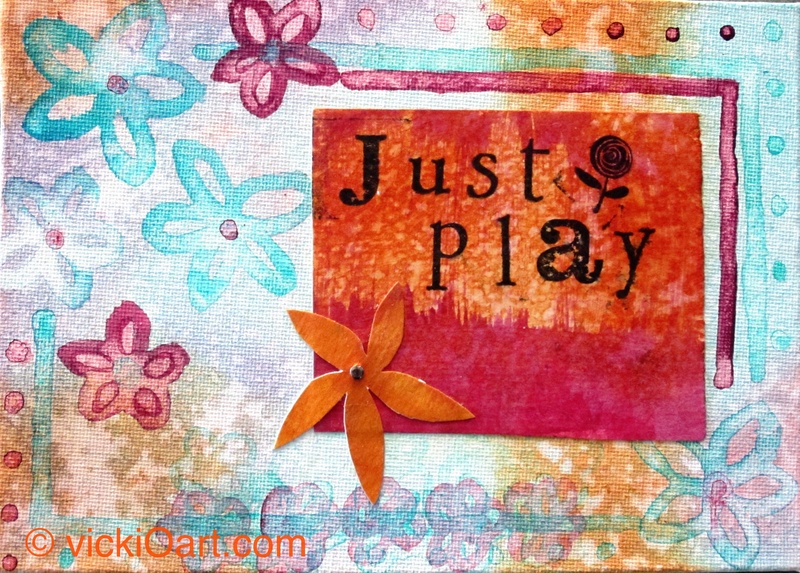 Luckily, JUST PLAY usually pops into my mind and reconnects me to my playful and intuitive artist who knows just what to do. She really gets it that fear and forcing an outcome are a sure fire way to shut my creative process down. And the most amazing thing is that healing happens when art happens. I guess another way to say that is healing happens when I just play. Mmmmm…. maybe I could just play during other stressful times. I encourage you to find your muse, and let her/him just play. You might be surprised at the outcome! Just Play! The outcome will take care of itself. After exhausting many western and complementary care options to no avail, I had several friends ask me whether I had tried acupuncture. Many years ago I had tried it a couple of times, and have witnessed several cases where acupuncture helped in the healing process. So I sat down with my iPad Isabel and my google search brought me to Mary Papa, L.Ac., right here in Fountain Hills. Mary has extensive education and degrees, and she is dedicated to “helping people heal naturally”. The moment I saw her picture on her website Mary Papa Acupuncture, I knew she was the one to see. So I listened to my friends and my intuition, and made an appointment. Mary is kind, gentle, and extremely knowledgable. She listens to me, asks questions, and trusts both her instincts and mine. My experience has been very helpful and healing on many levels, and I truly believe she is teaching me how to live a healthier and more authentic life. I feel more hopeful that I will get well, and as Mary said, “have more energy than I can even imagine”! So, acupuncture and Mary and Chinese Medicine has become an important part of my rescue plan! 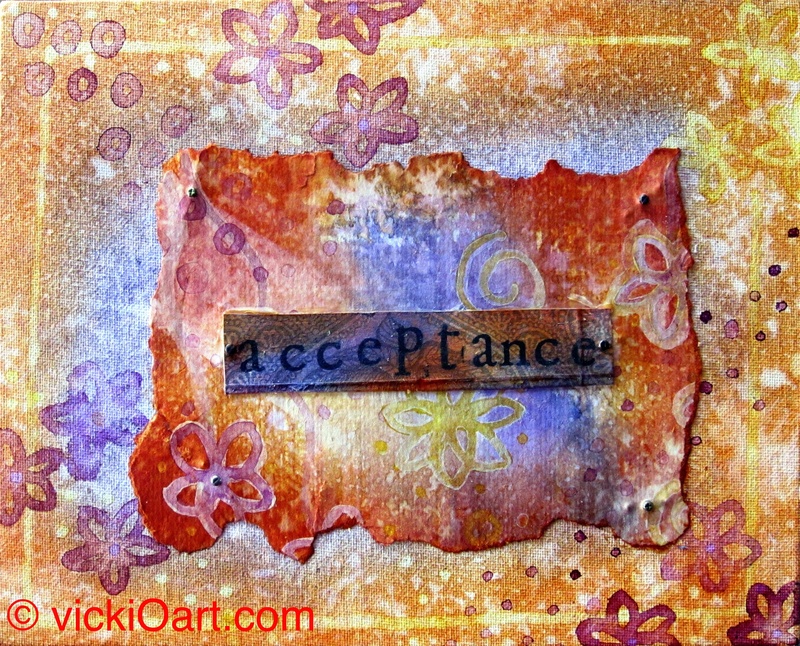 The definition of acceptance is “the action of consenting to receive or undertake something offered”. It sounds easy enough, right? Well, it has never been very easy for me. Especially when what is “being offered” feels like something I don’t want. And, when the “something” is loss or illness, it becomes even harder. The truth is, life is filled with mostly things that are out of our control. 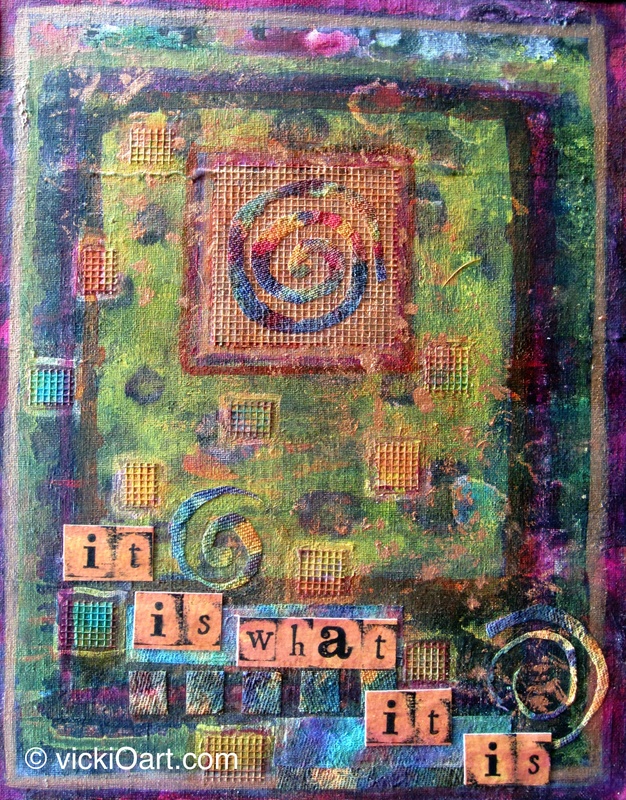 Over the years I have realized that railing against “what is” wastes energy and keeps me stuck. This doesn’t mean that I don’t do my fair share of crying and feeling and processing. Because in reality I find that the processing is what gets me to the place of acceptance. And from a place of acceptance I find I have the power to makes choices and grow and learn. So it may be messy at times, but it definitely works for me. “acceptance”, ink & acrylic on 8×10 canvas board. Have a wonderful day playing and accepting and leaning into life! Starbucks has great coffee, comfortable chairs and free wi-fi. They have great sandwiches, wonderfully fresh lemon bread and a frequent customer card where you can earn free drinks. Woo-hoo! You can sit in their cafes for some solitude, or with a few friends fixing the problems of the world. All of which is very comfortable, inspiring and mighty tasty. 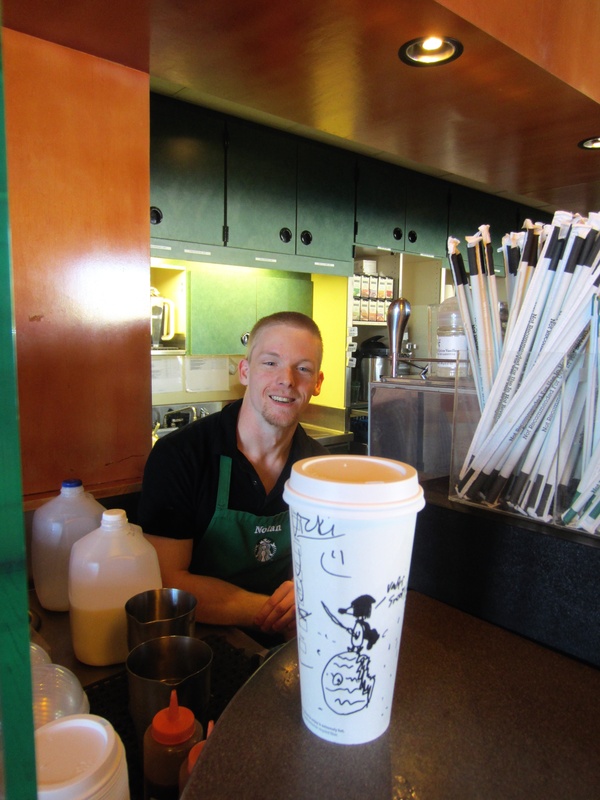 But the coolest thing about my Starbucks in Fountain Hills Arizona are the baristas and servers and managers. Long before I got sick, I was a daily visitor to Starbucks for my venti vanilla, non-fat, no-foam latte. Yes, daily. For some reason I’ve never mastered the art of brewing coffee at home. My husband would confirm the fact that I missed out on the cooking gene when it got handed out, so maybe that is why the whole home-coffee systems never worked for me. I loved being a daily Starbucks customer. It became my version of the sitcom, Cheers – you know, when everyone yells “Norm!” upon his arrival. 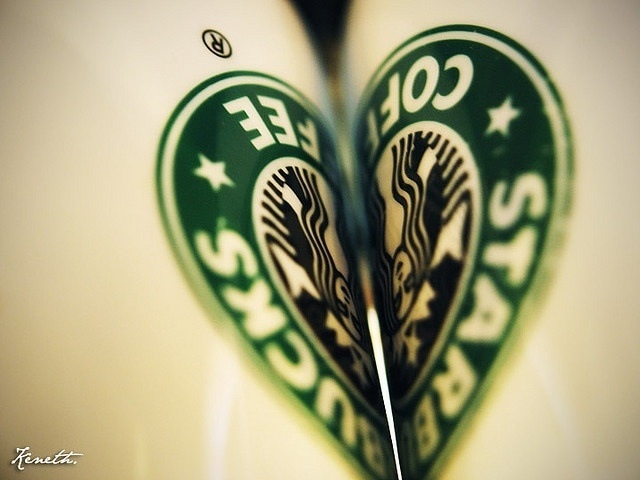 Everyday I would leave Starbucks with my lovely and delicious cup of coffee, feeling better than when I walked in. That makes that cup of coffee, and the people serving it, very special and quite priceless. When I first got sick, my daily trips to Starbucks stopped. What didn’t stop were those delicious handmade vanilla lattes. My dear friends or husband would make the coffee run for me, and deliver it with a smile and hug. When the partners (that’s what Starbucks call their employees) heard about my illness, they began sending me messages written with a black Sharpie on the outside of my coffee cups. 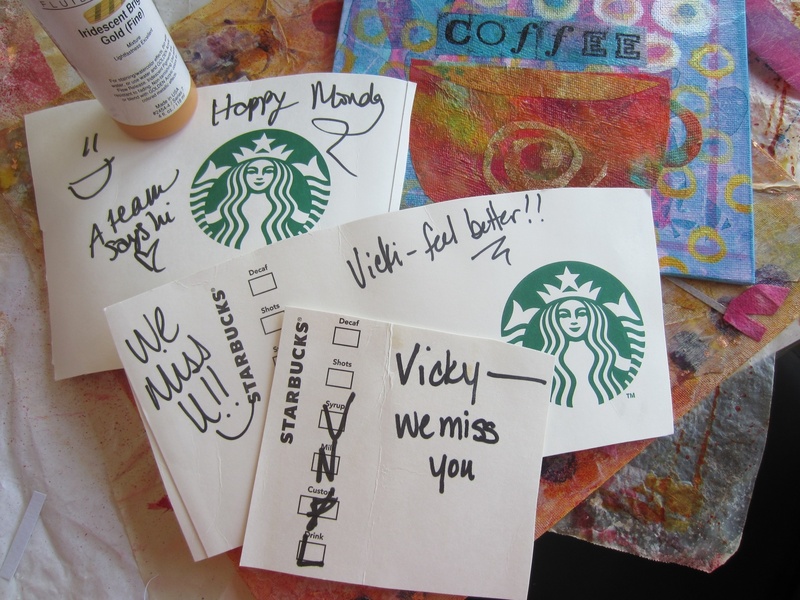 Every message brought with it a sense of healing, thoughtfulness and care, and every cup really did make me feel better. I was truly grateful beyond words. 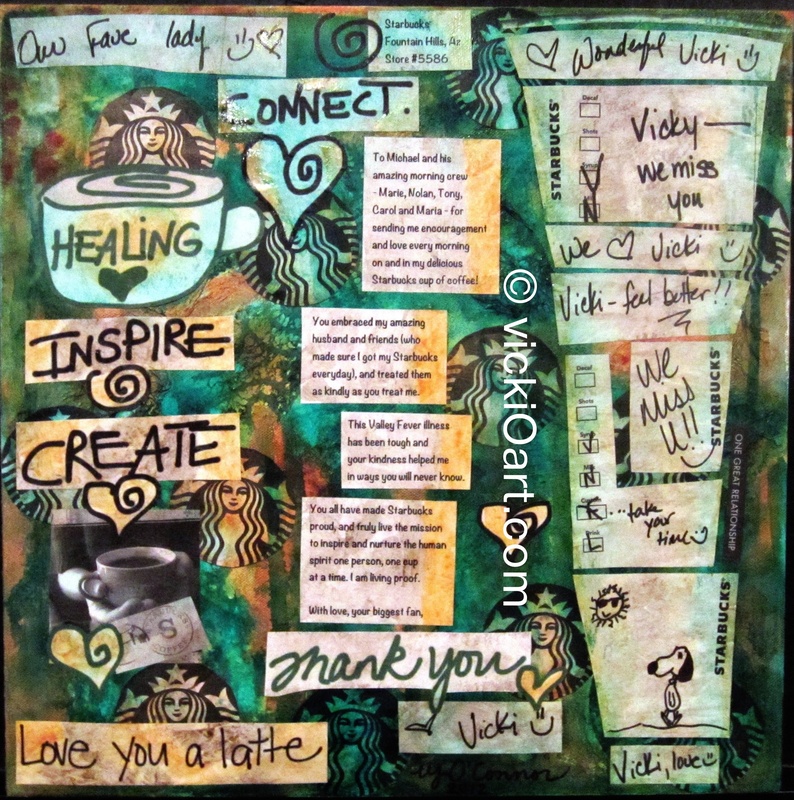 I couldn’t imagine throwing these special messages away, so long before I was well enough to begin painting, I began saving every love-filled cup that was brought to me. I didn’t know it at the time, but the Starbucks company mission is “to inspire and nurture the human spirit one person, one cup, one neighborhood at a time.” Well, I was (and still am) nurtured and inspired by the wonderful Starbucks partners every day. And when I thought they couldn’t get any better, Snoopy shows up one day. I lOve snOOpy! 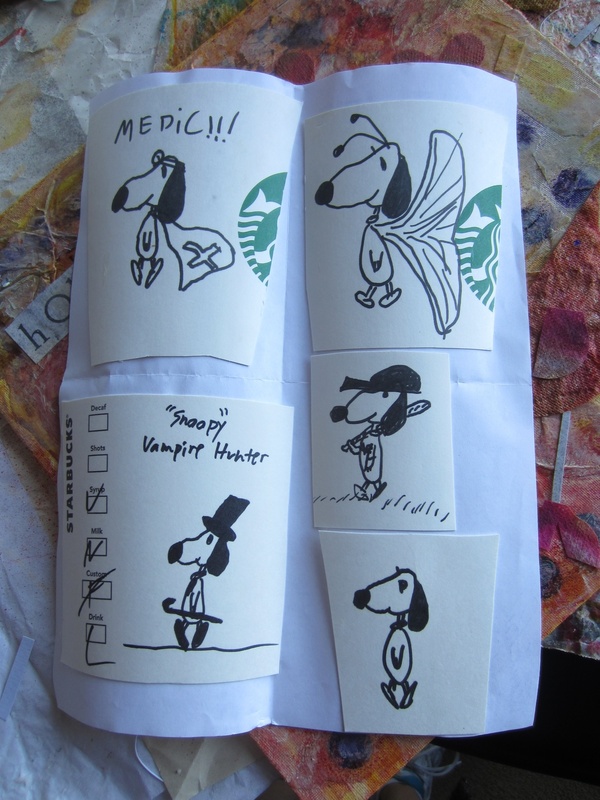 And it turns out that Nolan, the barista, is a master artist when it comes to Snoopy! Because of their kindness and creativity, I was inspired to dig deep and show my appreciation and gratitude to the wonderful Starbucks partners in a very special way. I wanted them all to know that what they do every day makes a real difference. So I stepped way out of my comfort zone and set out to paint them a one-of-kind thank you note. When it was finished I contacted the district manager and asked that she present it to the store manager and staff. They deserved to be recognized for their outstanding customer service and for carrying out the company mission with such grace. Many more fun and creative messages have come my way over the last year, and snOOpy has been busy celebrating holidays, going to Mars and fighting the dark forces. Another piece of Starbucks artwork is taking shape in my studio, so stay tuned. I will be forever grateful for the inspiration provided by the very special people of Store 5586 in Fountain Hills Arizona. Thank you, thank you, thank you! So treat yourself to a Starbucks today. Who knows, it may just change your life. One year ago, on February 8, 2012, I became ill with what I thought was an average head cold. My energy was zapped and my head was stuffed up, but my grand plan was to just to keep pushing through it. I continued to play golf, plan events, and workout (Jazzercise at least 4 times per week). By February 19, 2012 I knew I was dealing with something more serious than a cold. I could no longer push myself to be active in my life and I was very sick with headaches, nausea, cough, light sensitivity, body aches, rashes, night sweats and extreme fatigue. What began with a quick stop at the Walgreens clinic, turned into a year-long struggle for a clear diagnosis and effective treatment. As of today, I have found neither. I’ve seen seven doctors and tried every treatment that was offered to me – Amoxicillan, Doxycycline, Diflucan, Morinda Supreme, Symbicort, Cymbalta, Xango, flower essences, Oil of Oregano, Pau ‘d Arco, Multidophilus, massage, Yoga, meditation, IV vitamin treatments, herbal tinctures, adrenal support supplements, cranio-sacral bodywork and color therapy. Whew! No wonder I’m exhausted! A card my sister sent me. I do lOve the rain! I wanted this first blOg pOst to be about how well I’ve handled being forced, by extreme fatigue and illness, to be housebound for the past year. I wanted to share how taking the leap of faith to begin playing with art saved my life. While that is all true, what is really present today is fear. Fear that I may never get well. Fear that I may have a chronic illness for the rest of my life. Fear that I will never get to travel or play golf or go for another hike. I love being outside and I have missed it so much. I’ve missed so many special occasions and gatherings, and that has been really hard, too. I’ve always loved the movie Groundhog Day. It is so funny and heart-warming, and in the end, Bill Murray’s character learns the value of being honest, authentic and truly loving. What I didn’t get, until now, is the amount of courage and tenacity it takes to keep getting out of bed in the morning to do it “all over again”. 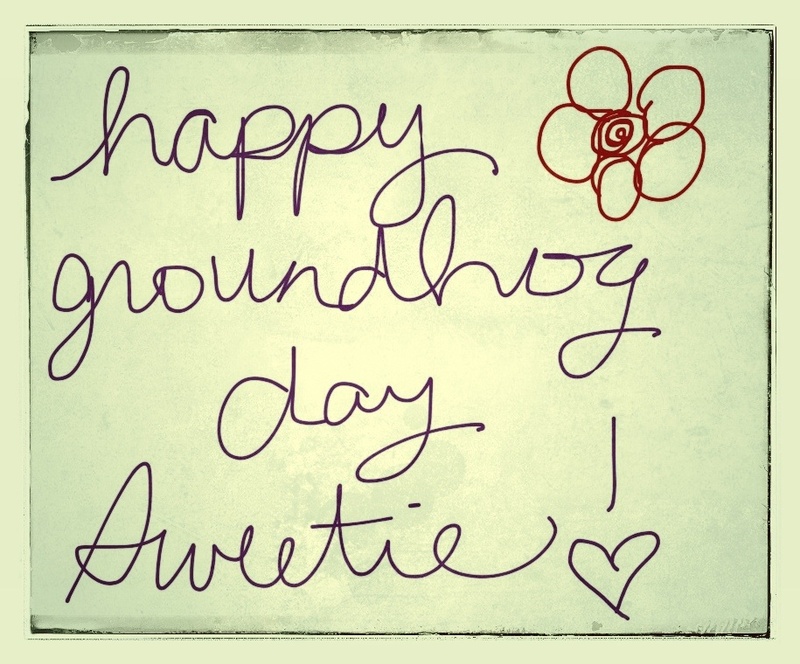 That darn groundhog isn’t so cute after day 200 or day 300 or day 366! I have been so sure that I have Valley Fever, but the truth is at this point, I’m not really sure what is making me this sick. Two doctors say Valley Fever (please read the abOut valley fever menu option for more information on this disease), one doctor says chronic fatigue, and another treated me for Lyme Disease and several other infections. Talk about feeling crazy! I’ve been on this roller coaster long enough. I’ve talked about it, painted about it, accepted it, learned from it, and even been grateful for it. And, yet, this is where I find myself. Still. So, once again, I return to my mantra: “It Is What It Is”. In the past, those words sounded like resignation to me (and not in a good way). Because of the last year, they now bring me peace. Peace that I really have done all that I could, and that I’m not to blame. There is something oddly embarrassing about being sick for so long, with no real explanation why. My friends’ oncologist said to me last week, “Well, it’s something.” That was exactly what I needed to hear! It IS something, and I won’t give up on finding what it is, and finding something that will help me get well. Until then, I will keep painting, and talking, and crying, and loving, and laughing, and being grateful for it all. Because the truth is, that is who I really am. 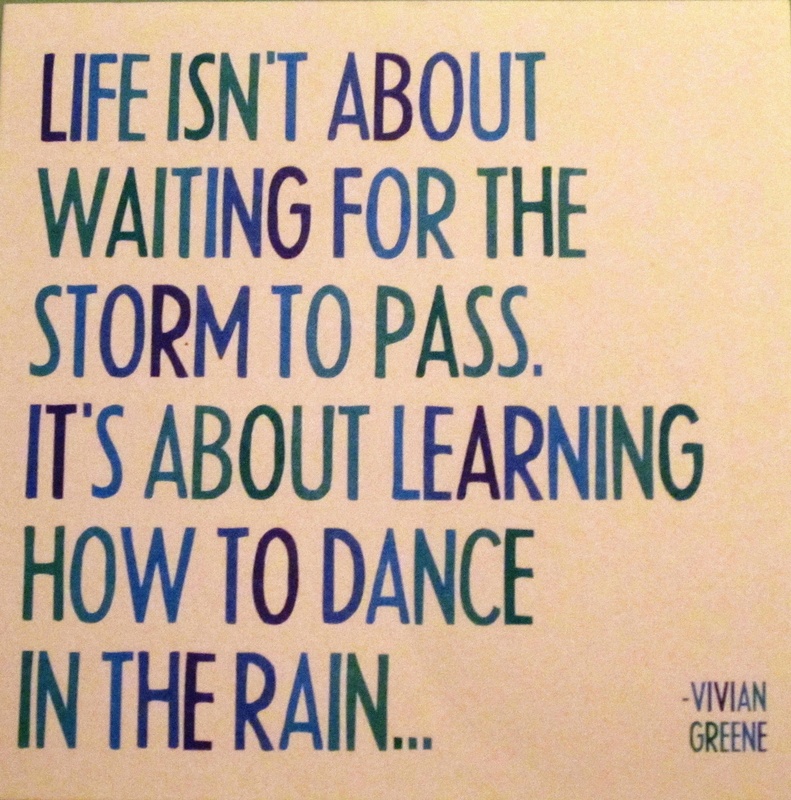 If you have favorite mantras that help you get through the really hard times, I would love to hear them. Thanks so much for listening, and sharing!